Hi all, this is a nice little post on last night's Great British Bake Off Masterclass programme on BBC2! Which if you couldn't already guess by my other posts I loved it! 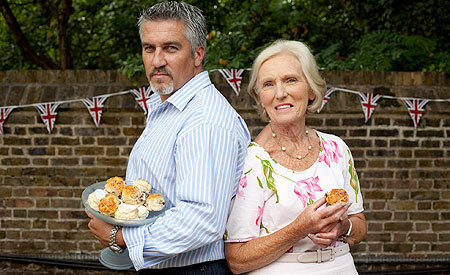 It was amazing to actually sit down and watch both Mary Berry and Paul Hollywood show you exactly how it's done. I'm torn between whether I prefer this to actual show because you see the baking being done at every stage, with perfect little tips from Mary and Paul. I think the other reason I liked this series is because you could see exactly how the tarts or bread where actually meant to turn out, but you also saw how much hard work it took, did you see how quick Paul was kneading that focaccia bread? You wouldn't need to go the gym if you did that every day, although with the amount of oil that the bread needs maybe it was a worthy exercise! The final thing that cheered me up was the fact that my very good friend Joey knew I was watching the programme and sent me a link which all of you Great British Bake Off lovers will adore!!! It is a 27 page programme with all the recipes from the final episode, it's great!! It's a little snippet of what the main baking book is, so it's perfect if you're still deciding to buy it or not. Trust me, you will want it! My friend got it off either Jo or Holly's (two of the finalists) twitter page and so I have no problems sharing this little piece of joy with you!